All Web addresses mentioned were functional as of 12-16-16. From the Cumberland Gap to the Atlantic Ocean, this is Virginia Water Radio for the week of December 19, 2016. This week, household water sounds open our focus on a legislative commission tasked with studying the supply and allocation of water to Virginia’s households and other users. Let’s drop in for about 60 seconds on this group’s most recent meeting. You’ve been listening to an excerpt from the November 30, 2016, meeting of Virginia’s State Water Commission. The speaker was Commission Chair Delegate Thomas Wright, Jr., of Lunenburg County. The Commission consists of 13 members of the Virginia General Assembly, including the chairs of the House and Senate natural resources committees, plus two non-legislator citizens. As noted in the excerpt, the Virginia Code mandates the Commission to “study all aspects of water supply and allocation problems in the Commonwealth; coordinate legislative recommendations of state entities having water-supply and -allocation responsibilities; and report annually its findings and recommendations to the General Assembly and the Governor.” In any given year, certain issues may receive particular attention; for example, in 2015, the Commission’s annual report included discussion of coal ash management; in 2006, desalinization; in 1995, the Lake Gaston water-supply pipeline; and in 1985, streamside conservation programs. At the November 2016 meeting, the Commission’s main focus was the eastern Virginia groundwater aspects of a study completed in October by the Joint Legislative Audit and Review Commission (or JLARC), which reviewed Virginia’s overall water resource management and planning. The 2015 Virginia General Assembly called for the JLARC study, and if the 2017 Assembly considers any bills in response to that study, it’s a good bet that one or more State Water Commission members will play a significant role in those bills. Thanks to Stephen Schoenholtz for recording the November 30 Commission meeting, and we’ll let the Commission chair adjourn this episode. Audio used in this episode was recorded by Stephen Schoenholtz at the Virginia State Water Commission meeting on November 30, 2016, at the Virginia General Assembly Building in Richmond. Screenshot of the cover of the Virginia Joint Legislative Audit and Review Commission’s October 2016 report on water planning and management. Image accessed online at http://jlarc.virginia.gov/landing-water.asp, 12/19/16. “1. Study all aspects of water supply and allocation problems in the Commonwealth, whether these problems are of a quantitative or qualitative nature. “2. Coordinate the legislative recommendations of all other state entities having responsibilities with respect to water supply and allocation issues. 3. Report annually its findings and recommendations to the General Assembly and the Governor. A recording of the entire State Water Commission meeting on November 30, 2016, is available at this link on the Virginia Water Central News Grouper site: Virginia State Water Commission Meeting on November 30, 2016. Virginia Code, starting at Section 30-186, “Chapter 24: State Water Commission,” online at http://law.lis.virginia.gov/vacode/title30/chapter24/. Virginia Division of Legislative Services, “State Water Commission,” online at http://dls.virginia.gov/commissions/swc.htm. Virginia General Assembly, “Interim Studies and Commission Listings/State Water Commission,” online at http://studies.virginiageneralassembly.gov/studies/188. 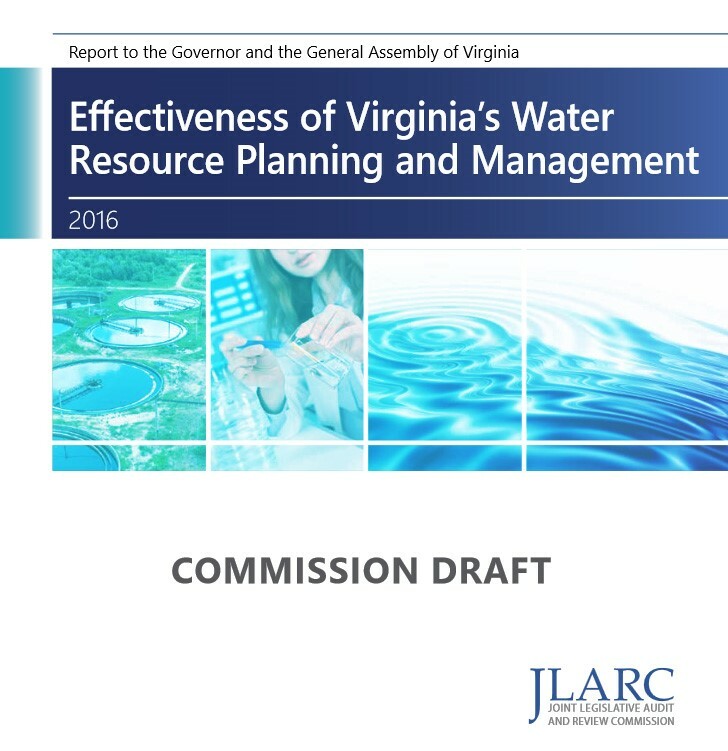 Virginia Legislative Audit and Review Commission (JLARC), “Effectiveness of Virginia’s Water Resource Planning and Management,” October 2016 (114 pages), available online at http://jlarc.virginia.gov/landing-water.asp. 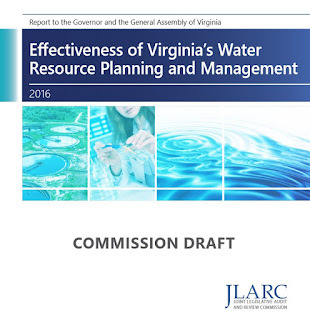 Virginia Legislative Information System, Virginia General Assembly 2015 House Joint Resolution 623: “Water resource and planning management; JLARC to study Virginia's resources,” online at http://leg1.state.va.us/cgi-bin/legp504.exe?151+sum+HJ623. Virginia State Water Commission, Annual Reports 1984-2017, online at the Virginia Legislative Information System, http://leg2.state.va.us/DLS/h&sdocs.nsf/Search+All/?SearchView&SearchOrder=4&query=State%20Water%20Commission. Virginia Water Resources Research Center, Virginia Water Central News Grouper: “Two Virginia Water Resources Studies Called for by 2015 General Assembly: 1) Eastern Virginia Groundwater Management Advisory Committee Convenes Aug. 18, 2015; 2) JLARC to Study Groundwater and Surface Water Planning and Management,” 8/17/15. Department of Game and Inland Fisheries - Episode 322, 6/27/16. General Assembly – Episode 143, 1/7/13; Episode 147, 2/4/13; Episode 196, 1/13/14; Episode 247, 1/5/15; Episode 252, 2/9/15; Episode 297, 1/4/16; Episode 302, 2/8/16. Marine Resources Commission - Episode 91, 12/5/11. State Parks (under Department of Conservation and Recreation) – Episode 161, 5/13/13; Episode 320, 6/13/16. State Water Control Board – Episode 94, 1/9/12. A previous episode on water supply planning and management is Episode 261 – 4/13/15.